CERENA’s researchers already have a long experience in advanced training and active coordination and participation in several MSc and PhD Courses offered by the host institutions as well as in advanced training programmes for industrial staff. Involvement in international degrees is also an objective to strive. The Master in Mining and Geological Engineering has partnerships with several international universities such as: Montanuniversitat Leoben (Austria), University of Mining and Geology ´St Ivan Rilsky (Bulgaria), University of Zagreb (Croacia), Universidad de Oviedo (Spain), Universidad de Vigo (Spain), Universidad Politecnica de Madrid - Etsi Minas (Spain), U. Politecnica de Cartagena (Spain), Politecnico di Torino (Italy), Universita degli Studi di Cagliari (Italy), Universitá degli Studi di Catania (Italy), Universitá degli Studi di Roma "La Sapienza" (Italy), Politechnika Slaska (Poland), Technická Univerzita Ostrava (Czech Republic). All students can complete the first semester of the master program at University of Leoben, the second semester at Freiberg University, and the third semester at Técnico. The master’s thesis, in the fourth semester, can be completed at any of the three partner universities. Petroleum Engineering (Técnico/ULisboa) -> Perspectives of dual degree with China University of Petroleum, East-China. The Master in Petroleum Engineering established partnerships with foreign universities for student mobility, namely University of S. Paulo (Brazil), S. Paulo State University (Brazil), State University of Campinas (Brazil), Petroleum Institute (Abu-Dhabi),Heriot-Watt University (UK), University of Wyoming (USA), Clausthal University of Technology (Germany), Freiberg University of Mining and Technology (Germany). 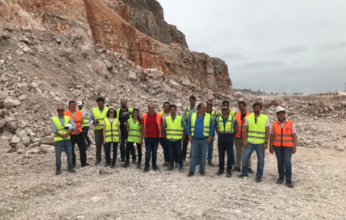 CERENA coordinates the consortium of Portuguese Universities – Técnico/ULisboa, FCUL and UA – participating in the Course of Advanced Studies in Geoengineering of Carbonate Reservoirs, created to serve the needs in advanced training of qualified personnel of Petrogal and Petrobras. In this consortium of universities participates also two top Brazilian Universities in the field – UNESP and UNICAMP. CERENA is/was also involved in other International Training Networks, as the example of the Erasmus Intensive Programme (Erasmus IP) network. This course counts with 10 editions where the trainees come from several national and international companies. This course was given in Luanda (Angola) for the technical personnel of Secretary of State for Mines of Republic of Angola Government. CERENA also offers “in-house” formation programs in reservoir characterization, mineral reserves evaluation and geophysical characterization, for international oil companies. The most recent courses have been given for companies in Abu-Dhabi, Brazil and Angola.